Some people believe that Valentine's Day is only associated with romantic love. But love comes in different forms and I'd like to believe that Valentine's Day is a celebration of love, in any form. 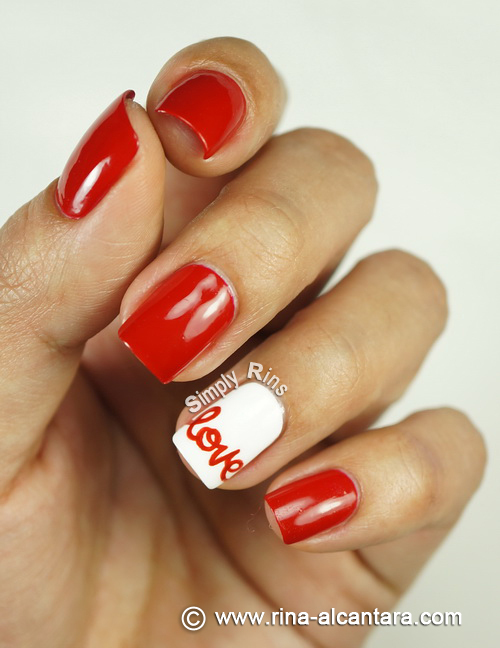 And so, I'd like to send that message across through a very straightforward and simple Valentine's nail art design. I went back to red, the color of love and my eternal favorite color. I decided on 2 accent nails and wrote down that four-letter that inspires us all on one nail and painted a few hearts on the other. I used 2 coats of Dazzle Dry Rapid Red on all my nails and also applied 2 layers of Dazzle Dry White Lightning for the accent nails. I hand painted the word "love" and the hearts using acrylic paints and a detailing nail art brush. I approximated the color of the paint with Rapid Red by mixing Liquitex Basics Cadmium Red Meduim Hue and a small dab of black. This would have been much easier with a red pen or a nail art pen compared to using a detailing nail art brush. But it's always good to keep challenging yourself, right? I always find painting letters on my nails rather difficult. My idea was to stretch the word so that it would touch both sides of the nail. And I also chose to place it near the free edge. I think it makes it more dramatic that way. Happy Valentine's Day to everyone! May love find and inspire you, everyday. It's gorgeous! I love the simplicity of it and the word "love" is written so beautifully. You wrote 'love' really beautiful. The hearts on your other hand are gorgeous as well. 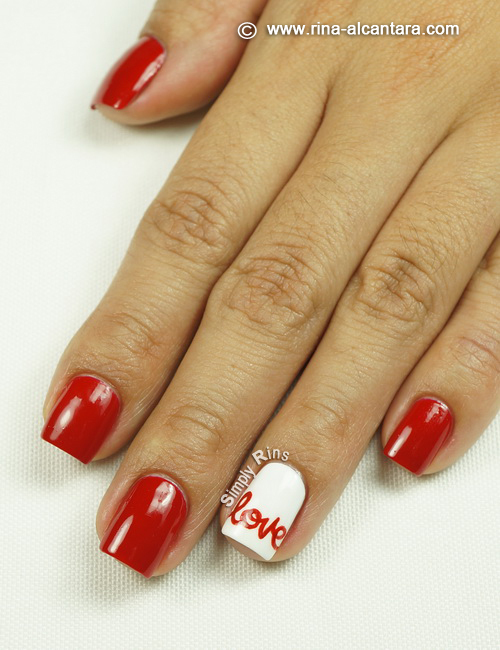 Lovely 'love' mani. I think you are so right - lovely mani! lovely nail art as always!